Aging is a natural process that we all must go through. That doesn’t mean that you don’t want to look your best. You simply want to face the aging process with grace and elegance. Fine lines and wrinkles, acne scars, and skin that has lost its firm youthfulness may make you look older than your years. Now, thanks to Microneedling with radiofrequency from Dr. Jeffrey Hoefflin, there is a minimally-invasive treatment that will revitalize your complexion. What is Secret RF Microneedling? Secret RF Microneedling is a revolutionary new process that combines the skin rejuvenating benefits of microneedling with radiofrequency (RF) skin tightening. This FDA-cleared procedure is a powerful way to revitalize your complexion with no social downtime. This type of Microneedling treats myriad skin concerns such as stretch marks, acne scars, fine lines and wrinkles, loss of firmness, and existing blemishes to tone your skin and produce that coveted lit-from-within glow. What are the Benefits of Secret RF Microneedling? What are the Benefits of Secret RF Microneedling with radiofrequency? Unlike many laser treatments or methods of skin tightening, Microneedling with radio frequency provides instant benefits and you will experience no downtime. This means you can go in for your Microneedling with radiofrequency session on your lunch break, and still make your important dinner date. Secret RF Microneedling stimulates production of collagen and elastin providing skin with volume and fullness, while tightening lose skin and restoring elasticity. You will also notice an improvement in fine lines and wrinkles, enlarged pores, the appearance of scars and stretch marks, and the secretion of oils. Following your treatment with Secret RF, the skincare products you use will have a greater rate of absorption and provide enhanced benefits. What Can I Expect During Microneedling with Radiofrequency?What is Recovery Like after treatment?What Kind of Results Can I Expect after Secret RF Microneedling?Is Microneedling with Radiofrequency Suitable for All Skin Tones and Types?What Areas Can Be Treated with Microneedling and Secret RF?How is Microneedling with Radiofrequency different from Standard Microneedling? Dr. Hoefflin will first apply a topical numbing cream to allow you to experience the procedure in complete comfort. Once the numbing cream has taken effect, he will pass the Secret RF Microneedling wand over the surface of your skin, ensuring uniform results on all areas to be treated. This wand provides both microneedling and RF benefits deep into the layers of your skin. Since a numbing cream has been applied, you will not feel pain during your treatment; just a bit of pressure and an occasional light, tingling feeling. The entire procedure takes approximately 30 to 45 minutes to complete. With Secret RF Microneedling, there is no social downtime. You skin may be slightly red or flushed immediately following your treatment. This flush is temporary and should dissipate within a few hours. It is imperative that you wear sunscreen directly following treatment with Microneedling as your skin will be particularly sensitive to the sun’s harmful UV rays. You may return to your normal skincare and exercise routines the day following your session. Dr. Hoefflin may provide you with a post-treatment serum and moisturizer to use that evening. The results of Microneedling with radiofrequency can be seen immediately and will continue to appear over the course of the next several weeks. Your skin will instantly be glowing, and you will see the tightening and toning results when you leave our office. The real, deep benefits of Microneedling will be evident over time as your body increases its production of collagen and elastin. 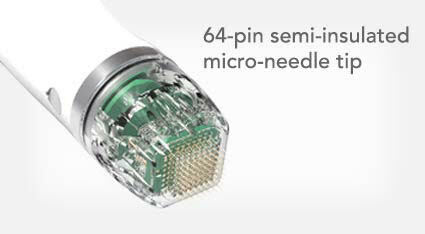 We recommend a series of three Secret RF Microneedling sessions to see optimal results. Additionally, Microneeding has been clinically proven to reduce the appearance of acne scars. The overall appearance of your skin will be smoothed, and its radiance restored. Yes! Laser treatments and chemical peels can be damaging for darker skin tones resulting in unwanted changes in pigmentation. Since Secret RF resurfaces the skin without removing layers or harsh chemicals, it is suitable for nearly all skin tones. In addition, Dr. Hoefflin has the ability to control the depth of each procedure performed. His expert care and guidance will allow him to direct the Secret RF wand to the precise depth that will give you the best results. Secret Rf Microneedling is not only a suitable treatment for facial rejuvenation, but can also be used to treat other parts of the body. It can be used to treat the neck, décolletage, hands, jowls, eyelids, and nearly any other place you would like to see the skin smoothing benefits. Traditional Beverly Hills microneedling treatments use a handheld device which creates very small injuries in the skin by penetrating it thousands of times with tiny needles. It is often combined with other serums or PRP (platelet rich plasma) to enhance the anti-aging benefits. 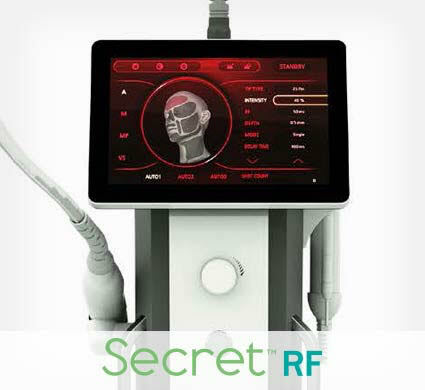 Secret RF Microneedling takes that a step further using the powerful technology of radiofrequency. The RF penetrates deep into skin’s layers tightening, toning, and stimulating production of collagen and elastin. So, in addition to the benefits provided by the microinjuries you receive through the microneedling process, you receive the deep skin revitalization of the RF laser and LED light therapy. Why Should I Choose Dr. Hoefflin? Our Plastic Surgery Clinic was created to provide you with the most luxurious, state-of-the-art procedures available. Dr. Jeffrey Hoefflin is a board-certified plastic surgeon who prides himself in staying up-to-date on the latest techniques, products, and procedures in skincare and cosmetic surgery. This means that he can provide you with the best advice available in Beverly Hills. If you are interested in the skin rejuvenating benefits of Secret RF Microneedling without the pain and downtime associated with other treatments, schedule your complementary consultation with Dr. Hoefflin today. He will carefully listen to your concerns and goals for your skin and advise you on the best path to achieving glowing results. This powerful treatment is unlike any other and can help you achieve the results you desire without the pain you don’t. Secret RF takes skin resurfacing to new, radiant places and allows you the freedom to get back to your life looking and feeling your best. So schedule a consultation with us today for arguably the best treatment of Secret RF with Microneedling Los Angeles has to offer.